The 170 series provides the high pressure and cleaning capacity to meet your needs. The 170 series is powered by a 170 HP John Deere diesel engine that delivers 2400 RPM. The following specifications will provide more information on the 170 series unit. Due to the high removal and cleaning power, these units pay for themselves after a very short of time. Ideal for specialized service providers, but also for construction companies, renovators and for industry. This class represents the cutting edge for mobile high-pressure units, delivering pressures up to 2,800 bar. These high-performance units are intended for the most difficult and demanding jobs. They are economical, easy to operate and offer high safety levels. They are thus ideally suited to building redevelopment, paint stripping, rust removal, surface removal or even, for instance, gReat exchanger cleaning. 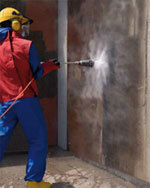 Even the most difficult deposits and coatings are quickly removed by this high pressure water blaster. 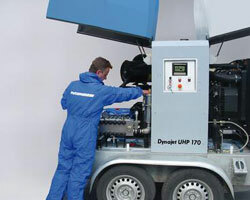 All UHP 170-models can be delivered in 3 versions: stationary without hood, stationary with hood and mobile with hood. The UHP170 units can be used with any tool from spray guns, spray lances, dump guns or surface cleaners. The tools can be easily connected to this high pressure water blaster due to the conveniently located discharge connections. All suction and discharge connections can be accessed from outside. 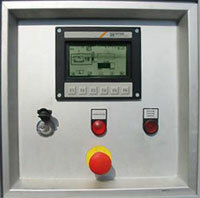 Matching the pump output to the connected tools is controlled by the UHP170 control system. All system control and regulating functions are controlled by a menu driven surface touch interface control panel. The menu driven control panel is practically self explanatory making the high pressure system operational and ready for use after a short training period. With the operating and service covers open wide you can reach the important parts with no problem. The UHP170 units are extremely versatile and allow customers to choose from many options; for example the unit can be offered with a trailer, but without the sound hood. The two piece hood allows access from all sides of the pump. The frame includes a 53 gallon (200 liter) integrated fuel tank allowing a full day of continuous duty operation. 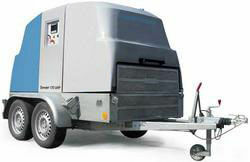 The unit is light – with a full fuel and water tank the pump unit weighs only 4620lbs (2,400 kg) including the trailer! The light weight makes the complete pump system easy to tow by a vehicle rated for this weight. For crane transport, an optional central lifting lug can be attached to the high pressure water blaster. 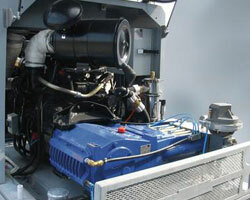 The diesel motor has substantial reserve power for operation in various extreme climatic environments. Thus, the UHP170 unit is able to operate in high altitudes and temperatures without any loss of power. The water cooled diesel motor meets strict emission standards and is made by reputable brand that offers quality service around the globe. when using high pressure water blaster. Volume of Water Tank 22 gal. 22 gal. 22 gal. Volume of Fuel Tank 52.8 gal. 52.8 gal. 52.8 gal. Dimensions (trailor with hood) 98.5" x 55.1" x 78" 98.5" x 55.1" x 78" 98.5" x 55.1" x 78"
Each high pressure water blaster unit is built to your specifications. Many options and accessories are available. Below are some ballpark estimates of typical configurations. Accessories are at an additional cost.